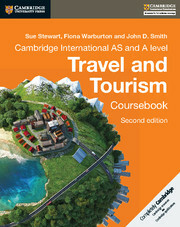 Endorsed by Cambridge International Examinations, this second edition of Cambridge International AS and A Level Travel and Tourism has been fully updated for the Cambridge Syllabus (9395) for examination from 2017. Written by experienced authors in an engaging and accessible style, this Coursebook contains a wealth of internationally focussed case studies and links to the key concepts throughout. This book offers comprehensive coverage with an international perspective and in-depth analysis of topics. John D. Smith has over 35 years of teaching experience in Travel and Tourism related curriculum. He is an experienced examiner and consultant. He has co-authored several textbooks and has several articles to his credit. Sue Stewart is an experienced examiner, moderator, developer and overseas trainer. She has extensive experience of both working in the Travel and Tourism industry as well as teaching. She has also authored several textbooks on the subject.